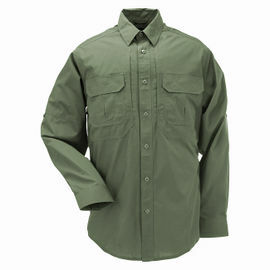 The 5.11 Taclite Pro Long Sleeve Shirt is now available after years of stocking the tough 5.11 Tactical Shirt, we decided to try out its lighter counterpart, the Taclite. This ultra-lightweight shirt is still extremely durable, making it ideal for trips in warmer climates. It features an exceptional fit, patented hidden document pockets and an unmatched heat management system. 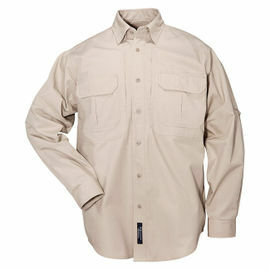 These Taclite Shirts feature hidden button-down collar stays and a handsome yet functional design. Triple needle construction and reinforced anti-crack, anti-chip melamine buttons result in an amazingly hard-wearing shirt. Stash travel documents, maps or your phone in 5.11’s patented hidden document pockets located on the front chest of the shirt. 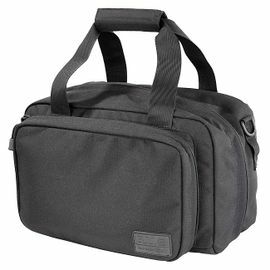 Discreetly designed with a Velcro closure and one-handed access, these are strong, roomy pockets. Overlaying the hidden document pockets are large, pleated patch pockets also finished with Velcro. The left pocket incorporates a dual pass-through slot for pens, chem-lights and tyre gauges. Two narrow pen pockets are placed on the left sleeve, totalling six pockets in all. In addition to its breathable fabrics and strategic construction, the 5.11 Taclite Shirts employ a large cape-back with a tacked center point. Moisture-wicking Drilex material works to efficiently vent and evaporate moisture around the clock. Stitched eyelets at each gusseted underarm further dispel heat and moisture to keep you cool. 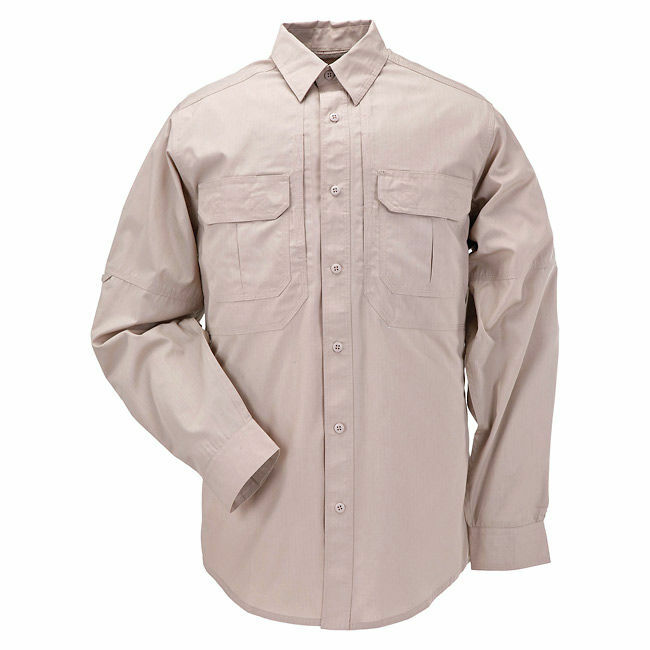 5.11 Taclite Pro Long Sleeve Shirt - Khaki is rated 5/5 based on 11 customer reviews. Ordered yesterday, delivered today. Excellent shirts, the fit is lovely. Thank you so much, they are that good, ordered another pair today. Excellent service and an excellent product, very happy customer. I am a 42 inch chest but the 40 inch was ample, generous sizes. The fit of this shirt is great, despite my fuller figure. I will be ordering more in different colours shortly. The lightweight version is warm enough for me, even in winter. I can wear a tee shirt underneath for additional warmth and will not need the heavier weight material at all. This shirt is light weight but so strong even the toughest Namibian thorns didn't tear it. the shirt is very breathable so great for hot weather. This shirt is perfect for what I need. Tracking in Namibia is going be really hot and this well designed shirt will help keep me cooler with its air vented back. Great fit. Not wash-and-wear; needs ironing. I wore this shirt in South Africa recently, excellent fit, by far the best of the bush shirts I have worn previously. This is a well made shirt which does not constantly ride up out of your pants. The two front chest pockets are of a large size and hold a passport without any problem. I was very pleased with the extra security pockets for bank notes, clearly very handy! 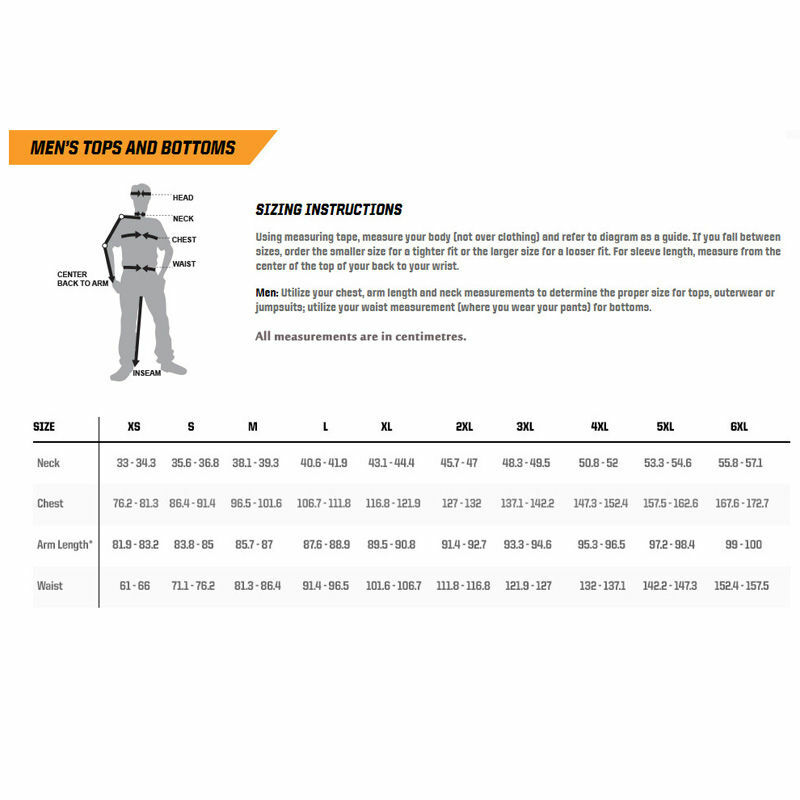 High quality shirt, reasonable price for what you get, large size really is Large, all the features I need from a go-anywhere shirt, on how it's built it should last for years, Teflon coating is a great idea it enables cool washing and really fast drying. Have now replaced all of my tactical shirts with these. Very happy to recommend. Excellent, as described, quickly despatched, definitely recommended. 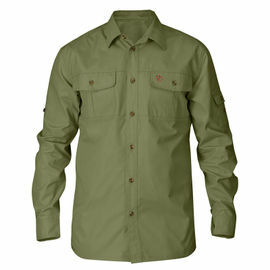 Great summer alternative to the heavier duty 5.11 shirts, usual good quality product we all expect from 5.11 and excellent service from Woodlore.